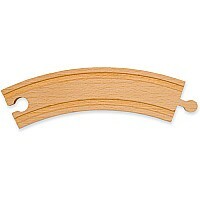 Curve to the left or right or form an 'S' with this bundle of six, double-sided 6" curved track pieces. Compatible with popular wooden railway systems. Measures approximately: 7.00 x 3.00 x 2.30 inches..